A woman covers her nose as she walks past garbage piled up along a street in Dekwaneh area, Mount Lebanon, Aug. 29, 2016. Rubbish is again accumulating on some Beirut streets after protesters blocked access to a dump, raising fears that last summer's garbage crisis, which provoked unprecedented street protests, could return. The return of trash piles is among a number of signs of how dysfunctional Lebanon's paralyzed political system has become, made worse because of sectarian tension that has increased with neighboring Syria's civil war. The government has not passed a budget since 2005, and Lebanon has been without a president for more than two years. In July last year, authorities shut the main landfill site for garbage from the capital without providing an alternative, causing months of festering rubbish to pile up around the city. FILE -- Garbage bags line a street in Jdeideh, east Beirut, Lebanon, March 3, 2016. That prompted massive protests in central Beirut that were unprecedented for having been mobilized independently of the big sectarian parties that dominate Lebanese politics. 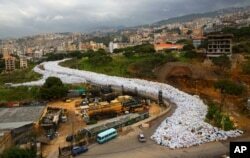 Plans for alternative dumps and even to export the rubbish were all rejected by residents, politicians and activists, until two temporary dumps in Beirut were eventually found. But these pungent seaside facilities are far from ideal: one is just 200 meters from Beirut International airport, and the other adjacent to the central residential and commercial neighborhood of Bourj Hammoud. In April this year, the Lebanese Pilots Association wrote to the government that more garbage dumped near the airport would raise the risk of birds attracted by the rubbish being sucked into aircraft engines, putting planes in danger. With the stench from the Bourj Hammoud dump spreading to other districts in the 30-degree heat, feuding political parties have sought to mobilize Beirut residents' frustration. Angry about the continued use of Bourj Hammoud, which the authorities are trying to develop into a long-term sanitary landfill, the Christian Kataeb political party blocked the entrance, preventing construction work. FILE - A car passes by a pile of garbage in Karantina, east Beirut, Lebanon, Dec. 17, 2015. "We have been here for 20 days to protest against filling the sea with garbage," said Roger Abi Rashed, deputy head of the local Kataeb branch. "We are here today to tell the government to find a sustainable, not temporary, solution to the rubbish issue." 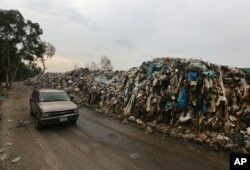 Angry that construction work was stopped, Bourj Hammoud's municipality, which was promised $25 million in development funding from the government in exchange for hosting the revamped dump, last week prevented garbage trucks entering the site. Unable to dump waste, the private company responsible for collecting rubbish, Sukleen, stopped collecting trash from parts of Beirut and the adjoining Mount Lebanon area on Thursday. Asked by Reuters why Sukleen could not use the other temporary dump near the airport, which is operational, a spokeswoman said Sukleen was "awaiting a disposal plan from the government." The head of the parliamentary monetary and budgetary committee said on Monday that he wanted neither the coast nor the streets of Beirut to become a dump and that there would be a meeting later this week with concerned municipalities. More than a year after the crisis began, however, Beirut residents see little chance of a resolution soon.